Waking in the beautiful Norwegian city of Bergen ‘the gateway to the Fjords’, I was excited about the prospect of riding the famous Flam Railway. Apart from spectacular views, I really didn’t know what to expect – but after spending the previous day exploring Bergen I was keen to find out more. After checking out of Hotel Augustin, I walked the short distance over to the train station. Even though this was a short walk I encountered a lively fish market, where I got my first sighting of huge King Crabs from in Northern Norway, and a typical Norwegian high street lined with many different shops and cafes. I arrived at Bergen Train Station where I was to catch the train to Myrdal, which would lead me to my highly anticipated trip on the Flam Railway. I was so focused on the upcoming trip that I well and truly underestimated the journey towards Mydral. The train waiting for me looked like any commuter train in London, so I planned to organise and clear my memory card to clear space for more photos of the truly breathtaking scenery of the Fjord region. But it wasn’t to be. I hadn’t done any of that organising upon my arrival in Myrdal (two hours later) because this trip had unexpectedly given me views ranging from the calm waters of the fjord to traditional Norwegian villages. 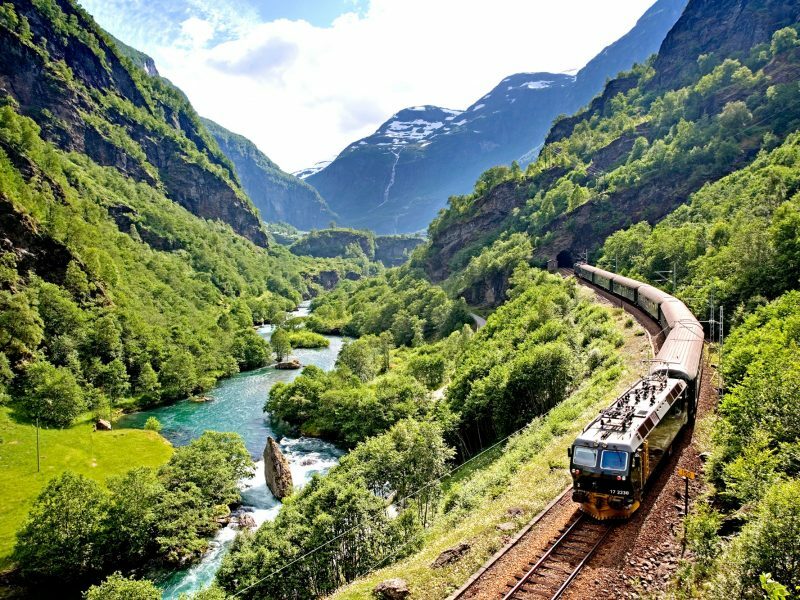 This train ride well and truly gave me the impression I was entering the wilderness and built my excitement for the Flam Railway – if the view from an ordinary train could be this good, what more could I expected from the unique train ride still to come? Upon arrival at Mydral we were met with an amazing view of a valley hugged by mountains and after drawing our eyes downwards we saw the bottle green carriages of the Flamsbana waiting for us. As we were finding our seats we were notified over loudspeaker that we should not worry about what side to sit on as we would be treated to equally amazing views on both sides. This announcement was met with ‘hmm, yeah sure’ from the group, but once again we should have had more faith. We were well and truly humbled as we started our climb down the mountain. Temporary darkness fell as we entered a tunnel, but before we knew it the most incredible views were hitting us on both sides. After the initial running from side to side to get that perfect photo, everyone realised that the best way to enjoy this amazing trip was sit down and talk it in all in. On most train trips in England, slowing down and stopping is met with frustration and the expectation of call from the driver to announce that a delay is inevitable. This was one delay we all welcomed. After a few seconds of confusion we realised that to our right was a flowing waterfall and we had stopped in order to give us the opportunity to step off the train to well and truly experience it. After re-boarding the train, everyone was in a relaxed mood and I believe this was the best part of the trip. No-one stressed about taking as many photos as possible but sat in silence and experience this truly unique journey. For the first time in my life, I believed the romantic nature of train journeys. This journey, which lasts less than an hour, in the space of a small time lets you relax, be amazed by the views and appreciate the perfect way to have the modern world with a natural wonder that is the Norwegian Fjord Region. 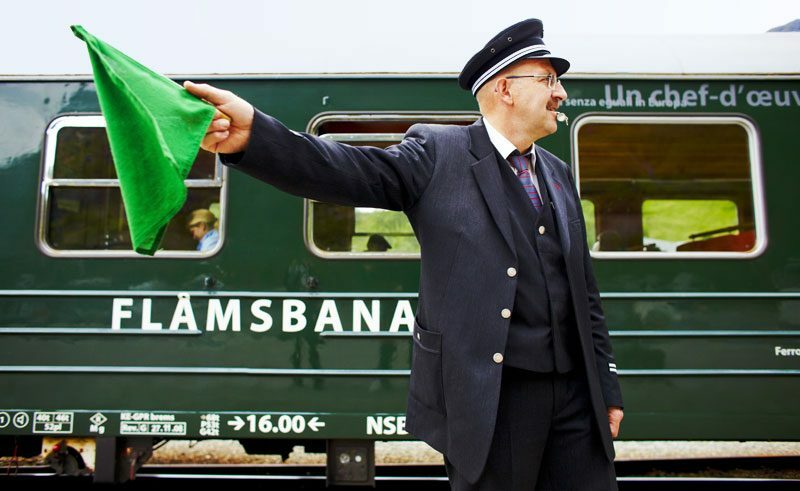 A ride on the Flam Railway is included in a range of our Norway holidays, including Over the Roof of Norway – on which you’ll travel between Oslo, Flam and Bergen.